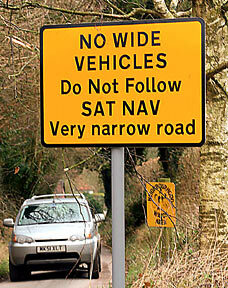 "There at the side of the road are the first signs in the country specifically warning them to ignore the satnav. Owing to a fault in the electronic information system, many drivers are sent through the Hampshire hamlet only to find the lane narrows to 6ft and they get stuck." This isn't the first time we've seen this kind of problem. I'm sure there are thousands of stories like this out there. And I'm sure that the more we improve the information system, the more we will find information gaps that get people in trouble.